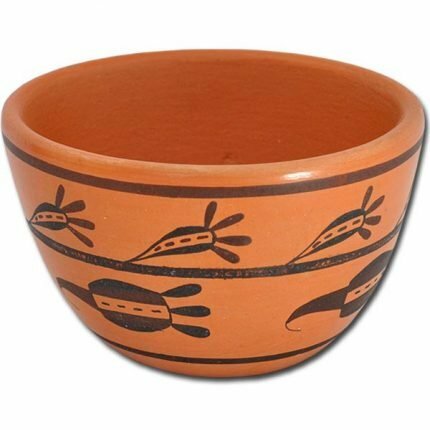 This handcrafted Hopi pot is painted with an ancestral design representing flourishing seed pods and has Gwen Setalla's distinctive signature on the base. The pot measures approximately 3″ wide at the rim and is 1-3/4″ tall. 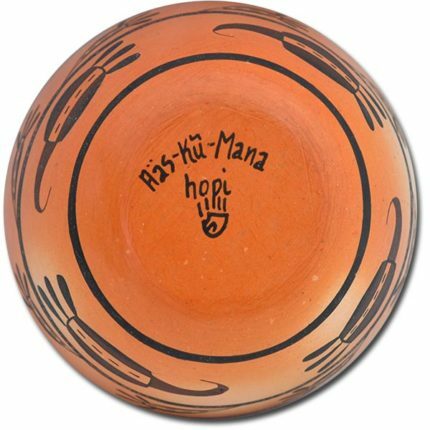 Hopi Water Jug by artist, Gwen Setalla. Gwen “Aas-Ku-Mana” (Mustard Juice Girl) Setalla was born into the Hopi Reservation in 1964. She is a member of the Bear Clan and the Water Clan. Her mother, Pauline Setalla, shared with her the fundamentals of working with clay using ancient traditions. Gwen took an interest in working with clay at the age of 5. Pauline gave her a ball of clay to play with and Gwen would make bowls by pressing the clay against her elbows and knees. Pauline then shaped it and completed the process for her at that time. Gwen gradually improved her skills as the years went by, learning how to shape, sand and polish the pottery. At the age of 16 she began to paint her own designs on her pottery and firing it on her own. According to Gwen, the whole process of working with clay was a real challenge. 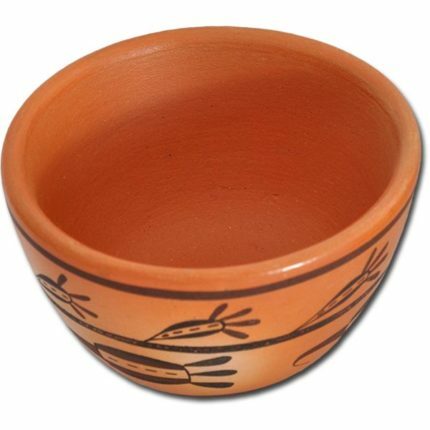 At the age of 21, her desire to experiment with new techniques and different shapes of pottery developed. She began engraving and protruding figures on her pottery. She finds these techniques most enjoyable, however, they do require a lot of patience and a steady hand. When working with clay, Gwen is always reminded of what her parents taught her as a child, “when creating a pot, you bring it to life and you breathe life into it, always treat it with the greatest respect.” She prays a silent prayer for every pot she creates and thanks all the great spirits for blessing her with this talent to continue a long live legacy. She signs her pottery: Aas-Ku-Mana, Hopi, followed by a Bear Paw to denote her clan origin. She also copyrights every piece she creates. Gwen is related to Joy “Frogwoman” Navasie (aunt), Eunice Navasie (aunt), Dee Setalla (brother), Charles Navasie (cousin) and Stetson Setalla (brother).